Evgeni Malkin doesn't get the media attention that teammate Sidney Crosby or fellow Russian Alex Ovechkin do. But that hasn't kept him from putting up points -- more points than anyone else in the NHL this season. Malkin put on a brilliant display of offensive hockey in a five-point night against Atlanta on St. Patrick's Day, scored the game-winner against Los Angeles three nights later and finished the week with 3 goals and 5 assists in three games. He's been a big reason for the surge that has carried the Penguins from outside the top eight in the East into contention for the last home-ice edge in the first round of the playoffs. For the season, Malkin's 105 points are tops in the NHL, and barring a slump or a huge surge by Crosby or Ovechkin, he'll finish the season with his first scoring title. Don't be surprised if there are more in the future. Martin Brodeur -- With win No. 552 under his belt, Brodeur's next target is the all-time shutout record of 103, held by Terry Sawchuk. He got No. 101 on Friday in New Jersey's 4-0 win over Minnesota and is 9-2-0 with three shutouts since returning from a 50-game absence due to a bicep injury. 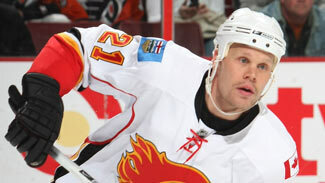 Olli Jokinen is quickly becoming a fan favorite in Calgary. Maybe it has something to do with 8 goals in his first six games since joining the Flames. Chris Osgood -- It's been a season of struggles for Osgood, whose won-lost record (24-6-7) belies his problems keeping the puck out of the net. But he may be rounding into form: Osgood has won his last four starts, allowing just seven goals and posting one shutout. Brian Elliott -- For someone who was chosen 291st in the 2003 Entry Draft, Elliott's career has already been a success. His play in goal has been one of the key reasons the Ottawa Senators are making a late push for a playoff spot in the East. Elliott has won his last eight starts, including all three last week. Alexei Ponikarovsky -- If only every night were Saturday: The Toronto forward had 2 goals and 2 assists in a 5-2 win at Montreal for his second four-point Saturday in eight days. He's already matched his career-high with 21 goals. Slava Kozlov -- After a midseason slump, Kozlov has found his scoring touch, producing 3 goals and 7 points in four games. He had one game-winning goal and won another contest with his specialty -- a shootout goal. Jay Bouwmeester -- Florida's drive for its first playoff berth since 2000 has hit a few potholes, partly because of Bouwmeester. The big defenseman hasn't had a point in his last six games and is minus-4 in that span despite averaging nearly 27 minutes of ice time. Manny Malhotra -- Malhotra had been having a useful offensive season until the last couple of weeks. He's gone without a point in the Columbus Blue Jackets' last seven games, though he's already matched his career high with 31 points. Ruslan Fedotenko -- Pittsburgh's hot streak has come without a lot of offensive help from Fedotenko. The big winger hasn't had a point in his last eight games and hasn't put the puck in the net in his last 14. Tom Poti -- Poti's lack of offense has to be a major disappointment to the Washington Capitals. He hasn't had a point in his last 10 games and has scored just three goals, none since Nov. 22. Marty Turco -- It's been a roller-coaster season for Turco, and last week was a definite downer. He was in goal as the Dallas Stars lost all three of their games, allowing 10 goals in the process. His save percentage of .897 is among the NHL's worst. Out -- Dallas got a boost with the return of center Brad Richards, who played Saturday after missing 15 games with a broken right wrist -- only to have Richards break his left hand in the third period. He's likely to miss the rest of the season. ... Calgary forward Andre Roy sat out Friday's game with an upper body injury. ... Los Angeles defenseman Denis Gauthier will miss at least a week with an upper body injury sustained Thursday. ... Washington forward Quintin Laing, who played his first NHL game of the season on Thursday, was hospitalized afterwards with a torn spleen. Laing was playing because Boyd Gordon was sidelined with a broken finger. ... Buffalo center Adam Mair missed the Sabres' last two games with a knee injury. ... Detroit forward Tomas Holmstrom missed the Wings' last two games with a sprained knee. ... San Jose forward Ryane Clowe will miss a week or so after undergoing minor surgery last week for a lower body injury. ... Tampa Bay defenseman Cory Murphy is expected to miss the rest of the season with a broken foot sustained Tuesday against Toronto. ... Minnesota's Mikko Koivu sustained a knee injury in the first period of Sunday's win over Edmonton, left the bench in the second period and didn't return. The Wild fear he could be out for a while. ... Rangers defenseman Michal Rozsival appeared to injure his left leg in the second period of Sunday night's game and didn't return. ... San Jose lost defenseman Rob Blake and forward Marcel Goc with lower body injuries on Saturday. Neither played Sunday. Blake is listed as day-to-day; Goc could miss a week or two. ... Phoenix forward Brian McGrattan will miss the rest of the season with an undisclosed injury sustained Thursday night against Anaheim. ... Colorado forward Paul Stastny hasn't played since sustaining a foot injury while blocking a shot on Tuesday. Forward Darcy Ticker didn't play Sunday because of a sore back. Both are day-to-day. Returning -- Minnesota forward Marian Gaborik played Sunday after missing three months with a hip injury that required surgery. ... Atlanta captain Ilya Kovalchuk returned Friday after missing three full games and most of another with a back injury. ... Los Angeles activated forward Justin Williams from the injury list; he played Friday night at Pittsburgh. Williams hadn't played with the Kings since they got him in a Deadline Day deal due to a broken hand. ... Boston forward Stephane Yelle was back in the Bruins' lineup Thursday after missing five games with an upper body injury. ... Chicago forward Patrick Sharp had two goals Sunday in his return from a knee injury that sidelined him on Feb. 14. Center Samuel Pahlsson made his debut with the Hawks on Wednesday. He was acquired by the Hawks from Anaheim at the trade deadline but hadn't played since Jan. 31 due to mononucleosis. ... San Jose defenseman Christian Ehrhoff was back in the lineup on Thursday after missing three games with an upper body injury. ... Islanders defenseman Andy Sutton hopes to return this week. He's missed more than three months with a broken foot. Center Doug Weight, sidelined since Feb. 14 with a sprained knee ligament, also could be back this week. ... Florida defenseman Bryan McCabe returned on March 16 after missing three games with a broken nose and orbital bone. The Panthers also hope to have forward Nathan Horton available for Monday's game against Carolina. He's missed the Panthers' last six after undergoing surgery on his left ring finger. Still out -- Calgary forward Todd Bertuzzi is skating again as he recovers from arthroscopic knee surgery. The Flames hope to have him back by the first week in April. ... Buffalo goaltender Ryan Miller was able to skate during practice last week, but there's still no timetable for his return from a high ankle sprain he sustained a month ago. ... Anaheim defenseman Francois Beauchemin skated Thursday for the first time since undergoing knee surgery before Thanksgiving. Barring a long playoff run by the Ducks, he's not due back until next season. ... Tampa Bay goaltender Mike Smith hopes to play again this season; he hasn't played since Jan. 30 while trying to recover from post-concussion syndrome. He's improving but still nowhere near ready to get back on the ice. ... Colorado captain Joe Sakic has been taking part in on-ice workouts. He's missed most of the season with broken fingers and a back injury that required surgery, but hopes to play before the end of the season. ... Toronto had hoped to have injured defenseman Tomas Kaberle back for Saturday's 5-2 win over Montreal, but the Leafs now say he'll probably be out until this weekend. ... Nashville refuses to rush captain Jason Arnott, who's missed five games with an upper body injury. They say he hasn't progressed as quickly as hoped and is questionable for Tuesday's game. The week ahead -- Lots of games again this week: 12 teams play four times and 14 have three, while only four clubs play twice. New Jersey at Philadelphia (March 23) -- With Versus on hand, the Flyers -- coming off their win Sunday in Pittsburgh -- get what could be their last chance to overtake the Devils for the Atlantic Division lead. Detroit at Calgary (March 23) -- Two of the three division leaders in the West meet, with the Red Wings seeking to atone for a 6-5 home loss to the Flames earlier this month -- a game in which they blew a 4-1 lead. New York Rangers at Pittsburgh (March 28) -- Mellon Arena has been a tough place for the Rangers, who've dropped their last four there and haven't won in regulation since Jan. 19, 2006. Minnesota at Edmonton (March 29) -- Don't blame the Wild if they're a little fatigued for this one. It's their fourth game in six nights on the road and caps a stretch in which they played 14 of 17 games away from the Xcel Energy Center. Minnesota Wild -- The Wild visited New Jersey Friday, came back for a home game Sunday afternoon, then head back to the New York area for games against the Rangers and Islanders, part of a four-games-in-six-nights trek this week that ends with visits to Calgary and Edmonton. Florida Panthers -- Florida starts the week with a home game against Carolina before hitting the road for games at Buffalo, Philadelphia and Dallas -- a tough stretch of four games in six nights. Vancouver Canucks -- Vancouver began a six-game trip at Phoenix on Saturday and plays for more games away from G.M. Place this week, visiting Dallas, St. Louis, Colorado and Chicago in a six-day span. Dallas Stars -- The Stars spent last week out West; they'll spend this week at home hosting Vancouver, Los Angeles and Florida as they try to stay afloat in the Western Conference playoff derby. Montreal Canadiens -- The Canadiens continue a five-game homestand that's vital to their playoff hopes with games against non-playoff teams Atlanta, Tampa Bay and Buffalo. Pittsburgh Penguins -- The Penguins continue their eight-game homestand by playing just twice, hosting Calgary on Wednesday and the New York Rangers on Saturday afternoon.